Until now, there has been no true safety monitoring solution for employees working in remote locations. Blackline Safety’s Loner Bridge System is the first comprehensive solution and consists of two parts—the Loner Bridge portable satellite base station and the Loner 900 employee-worn safety monitoring device. Certified intrinsically safe, Loner®900 continuously monitors an employee’s real-time safety. Its SureSafe™ monitoring light provides confidence to the user that his or her safety is being monitored continuously. When an incident occurs, Loner 900 instantly communicates a safety alert and the worker’s precise location to monitoring personnel, empowering an efficient, pin-point emergency response. Loner 900 was designed from the ground up to operate as well indoors as it does outside. A robust, industrial-grade radio link maintains a connection with Loner Bridge that provides freedom to employes to operate up to 2 km away in real-world conditions—even further when line of sight permits. Loner 900 is compatible with Blackline’s Loner Beacon indoor positioning technology, providing precise positioning when GPS is unavailable or imprecise. A combination of automatic and manual safety monitoring features keep employees connected to monitoring personnel, including fall impact detection, man-down detection, periodic check-in, emergency latch, and silent emergency button. alerts communicated to monitoring personnel include the geographic location of the worker in distress for immediate and efficient emergency response. Monitoring options include email, SMS, and web portal. 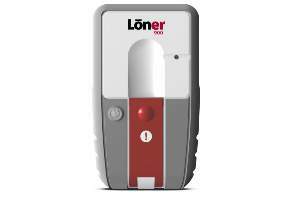 The Loner system can be self-monitored or externally monitored via Alarm Receiving Center (ARC), or both. Fall detection technology: True Fall Detection®, tri-axis accelerometer, tri-axis gyro, plus software processing | Emergency latch: open latch to trigger alert | Silent emergency: press & hold acknowledge button to trigger alert | Worker No-motion detection: configurable time window (1 – 30 min, or Off) | Worker check in: configurable check-in period (5 – 180 min) | Automatic Check-in on GPS motion option. indicator light array plus vibration and buzzer: safety alert triggered | Green indicator light: blinking (not connected), continuous (connected) | Yellow indicator light: TeamAlert™—return to Loner Bridge to coordinate local emergency response | Blue indicator light: Monitoring personnel acknowledged received alert.